Work on Harlem Station recently resumed. I’m mainly motivated in finally implementing JMRI Operations on this layout to create automated switch lists. While the learning curve is quite steep, the software itself has a lot of potential, particularly for such a terminal. Setting up a credible operating plan isn’t as easy as one could think even if this layout is rather small. It is quite a busy place and space is at premium. It quickly becomes a real issue when you run a few passes with JMRI and see how the car moves on the property. As a matter of fact, most of you know I set the layout date to 1952. It is mainly based on information found in an article about Harlem Station that ran in Erie Railroad Magazine that specific year. It provides a list of customers and commodities handled by the terminal, which is premium information to start building a decent switch list. But nothing is ever simple or straight forward with Harlem Station and I’m still struggling with the track plan even if I’m studying this terminal since 2010 (it’s been 7 years!). Erie Railroad Magazine mention there is 10 sidings for a total of 55 cars that can be handled. But on my layout, I’ve got about 13 sidings that can hold more than that. What’s the problem? Where did I mess up? The answer is simple, but finding it required to study a lot of old pictures, most of them bad reproductions of printed material. To booth, some parts of the yard are seldom photographed, probably due to accessibility and the fact most photographers prefer to shoot locomotives. Add to that the fact I’ve never been in New York of my life, the prototype no longer exist and I’m stuck with limited access to primary and secondary sources… no wonder it’s so hard to piece up the puzzle. Then let’s clarify some things about the different structures at Harlem Station. From now on I’ll call “Freight House” the large brick and concrete structure standing near Exterior Street. This is the office and it acts as the defacto “station”. The gantry crane was standing on the property, on the same spot, from day one until the terminal closed down under Erie Lackawanna tenure. The concrete loading ramp also seems to have been there since the beginning too. Now, let’s tackle the freight shed/thawing shed issue. This is the long wood structure built by the concrete ramp and a lot of speculation exists about it. Without much fanfare, here are my findings. Reminder: please bear in mind most historic Harlem Station pictures aren’t in the public domain and by respect to their owner, I won’t publish anything. This freight shed is not an original building. On pictures shot in 1929 and 1932, even if not clear, the shed doesn’t show up. In the 1932 one, it is particularly clear two sidings run parallel up to the concrete ramp (sidings #04 and #05. My layout is based on that design and while not very accurate, the 1928 Sanborn Map do show the big freight house, the pontoon and what seem to be a structure over siding #09 (I wouldn’t be surprised this short siding used to be an engine house similar to the one standing at the adjacent CNJ Bronx Terminal.) However, no trace of the long freight shed which would have caught attention of people surveying the area. The next piece of evidence is the 1942 Bromley Map which clearly depict the long freight shed built over what used to be siding #05. In fact, that siding is still – partially? – in place and run up to the shed wall. The next photo evidences are from circa 1951. At that point, we have relatively good shots of the shed. While we can clearly see the turnout leading to siding #05 is still in place, there is not enough space to spot a car in front of the shed. Interestingly, a large pair of door exists on the end wall has if cars could have been shoved into the building. This is probably what lead peoples to propose – as an unverified hypothesis – it could have been a thawing shed for coal hoppers. While this idea would be great and logical, this is not my conclusion after carefully analyzing the architectural feature of that structure. It must be noted the end doors, while sufficiently tall to clear a freight car, aren’t large enough. Also, some 1950s pictures clearly show a wooden platform serving that door with delivery trucks. This is further confirmed by the presence of a floor inside the structure. If I could describe it better, I’d say the freight shed was built over a wood platform erected on concrete bases. The presence of that platform or floor can be attested on every picture showing the freight shed. Thus, it would have been impossible to shove cars inside the structure. Finally, on some picture, it is clear siding #05 is buried in dirt and used by trucks to access the freight shed loading dock. All these evidences – combined with the fact the shed bear very little architectural resemblance to real thawing shed – proves it was a freight shed probably built to supplement lack of storage space at Harlem Station. It seems sacrificing a siding was less important than getting additional warehousing capacity. Thus, it is not a mystery this structure disappeared circa 1957 when the freight house was substantially enlarged. Since many sidings were removed at that time and the wooden freight shed was redundant, siding #05 was put back in service again. Now, some people will ask what happened with siding #05 when the freight shed was built. My educated guess is the siding was left there and the structure built over it. There was little incentive to remove the track and maps and photos all agree the turnout and rails were still in place when the freight shed was still standing. This is interesting because it could indicate the freight shed was a temporary measure and Erie didn’t thought it was required to remove the track since they could be used later. It should also be noted the freight shed was quite a hastily-built structure clearly not made to last a long time. But how all that new information impact the layout is interesting because it helps to understand the discrepancies between Erie Railroad Magazine description and my track plan. So let’s see things through new lenses. Clearly, the sidings referenced by the 1952 article could be #01, #02, #03, #04, #06, #07, #08, #10, #11, #12 and #13. But that brings the count up to 11. Certainly #05 didn’t count since it was buried under the freight shed and unserviceable at that time. #09 was very short and all photographic evidences (including aerial photos) show this track was not accessible by road vehicle (no concrete pad, no dirt road and no grade crossing). It seems it was only used as an extra off spot car storage (some pictures show a car spotted there), maybe still used as an engine track from time to time. Unfortunately, is it hard to tell what was the last siding omitted. All of the remaining ones were actives and used to load and unload cars. My first idea was that one of the very short sidings at the pier (#01 and #02) was omitted. But both had a road access and were in use. Even the shortest one did hold two hopper cars for Miranda Coal. Could siding #01 have been only a storage track for Miranda since it would have been hard to unload a car there into a truck? I can’t tell, but on aerial photographs, there is a hint of a small concrete pad build against 149th Street retaining wall. Anyway, there is no trace of coal handling at siding #02, confirming that commodity was unloaded on siding #01. Then could it be that siding #02 was used only to hold extra cars even if it was perfectly accessible by truck? It could be. After all, a 1957 photo shows a loaded PRR coal hopper left there but in a spot that couldn’t be used for unloading purpose. Also, cars are seldom seen spotted on siding #02. A set of picture shot there in 1951 show a boxcar on the pier while the locomotive is picking up and setting out cars on the car float while a color picture from 1955 show a flatcar hastily left on the siding in similar conditions. This brings me to think this track could have been used as extra space when sorting out cars. It is perfectly located for the task and can be used to store extra cars the rest of the time. It would have been really handy and if required, it could have been used as an extra spot on demand. Thus, I can now affirm with a decent level of certainty the ten sidings used by customers (this precision is critical) back in 1952 were #01, #03, #04, #06, #07, #08, #10, #11, #12 and #13. Erie Railroad Magazine mentioned the terminal could handle 55 cars at once which, incidentally, is exactly the capacity JMRI computed for my layout. This, I feel, is a great achievement. Thus, I reach the conclusion of my research. Certainly I could go further, but the hours invested wouldn’t probably pay off in term of enjoyment. The layout is as accurate as can be with the data I can reasonable gather. At this point, continuing the search would divert resources, time and money that would better be invested directly on the layout. 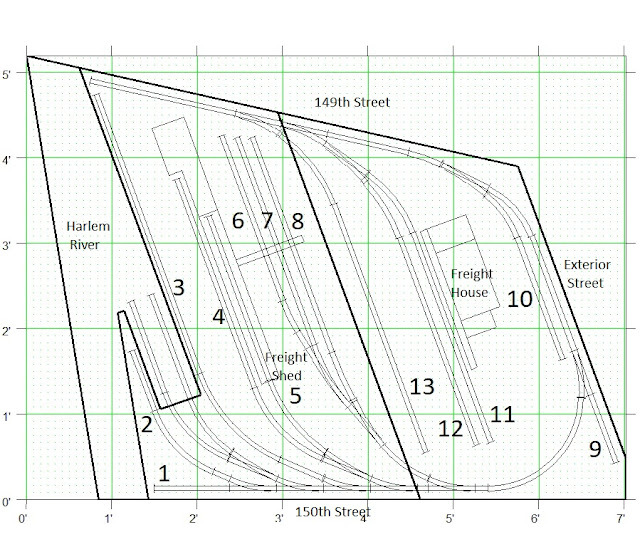 Such efforts would be to scratchbuild the freight shed and modify (or replace) the Walthers car float so it has only 2 tracks and a center platform as it used to be the rule on Harlem River. This would bring the maximum of cars brought to the terminal at 12. According to 1951 Erie statistics, about 1800-1900 cars were handled that year. With a 6-day per week schedule, it would be an average of 6 cars per day, which is consistent with period photographs which show about 6 to 7 cars on the float. Doing so would reduce the exhausting workload generated by JMRI (16 cars per carfloat) and help alleviate the layout saturation with cars. This little detail as caused many car routing issues due to the impossibility to find open spot. And we must keep in mind that with an average of 32 moves per sessions, at about 3 minutes per move, operating the layout can take over 90 minutes which seems to be a little bit over the top if it happens to often. On the other hand, an average of 6 cars brings the session length to a comfortable 35 to 45 minutes, which I consider optimal to ensure the crew isn’t exhausted and isn’t bothered taking time to operate as prototypically as possible. Finally, another aspect that JMRI brought forward was how often cars come back on the layout even with more than 60 cars on the roster. It became almost a joke after building several virtual trains. At some point, many cars were in and out at every session to the point suspension of disbelief was no longer working. It means three things: bringing the number of car per train lower will reduce the need to feed cars onto the layout, fine tuning the schedules will be required so cars won’t magically appear the next session when they should be traveling thousands of miles and the roster will need to be buffed up. This last item isn’t truly an issue since I have many cars in my stash that could make great modelling projects. The diversity of rolling stock handled by terminal such as Harlem Station is also a great opportunity to learn better about railroading all over North America. By the way, I’d like to point out I’ve been using OPSIG customers lists [ML1] to bring life to my layout by using real life customers for the layout. It certainly isn’t required, but felt it brought a sense of purpose to the layout. Isn’t it great to know that specific reefer is loaded with Carnation Milk from that plant or this Bronx based waste paper broker sell is stuff to a large paper mill in upstate NY? No need to go in great details, but knowing a few real customers of Harlem Station, the commodities handled and the roadname of cars seen on photographs really helped to shape a credible and immersing world.